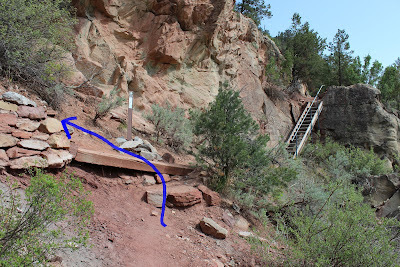 The Squirrel Trail is located in Rifle Falls State Park about 12 miles north of Rifle, Colorado. Rifle Falls has been a popular destination for local visitors for decades. The natural beauty of the falls with their limestone caves and the crystal clear water of Rifle Creek is making the local secret harder to contain with more and more visitors coming to visit the area. The canyon above the falls has been attracting hunters, fishermen and family gatherings for many years and is now one of the most popular destinations in the country for rock climbers. The Squirrel Trail forms a complete loop that can be hiked in either direction. For this post we will be starting from the overflow parking area near the entrance station. The trail begins on a broad hard packed path that travels through the walk-in camping sites. Each of the walk-in sites are equipped with a table, fire ring and a bear box for storing your food and personal items. It is best to keep everything including your toothpaste and hand soap in the box rather than in your tent. Bears are attracted to pretty much everything that smells like food or perfume and they can sense it from a mile or more away. At the end of the camping area there is a suspension bridge to take you across the creek. As it swings quite freely you may want to cross it one person at a time. Once across the bridge the trail doubles back along the other side of the creek. After a short distance the trail begins climbing several switchbacks up the side of the mountain. 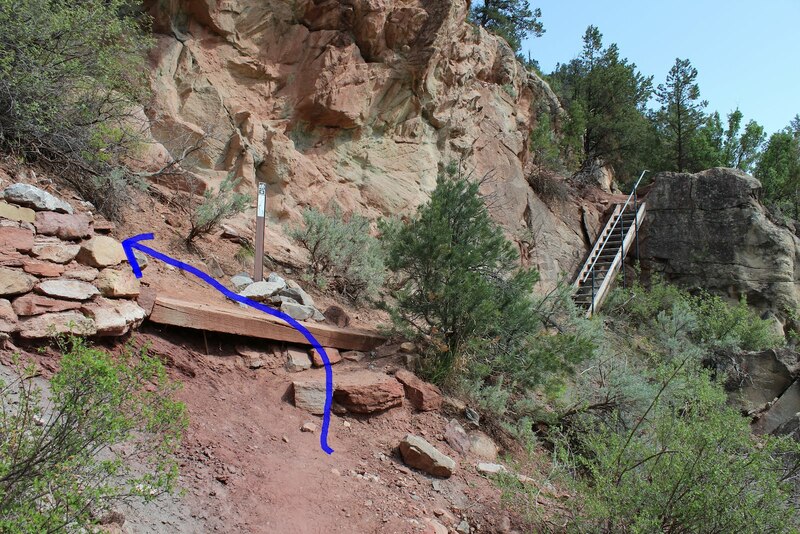 There are a few steps to help with the climb but a couple of spots are a little steep with loose rocks and scree. The trail only climbs about a hundred feet all total before it levels off. The trail turns to your left at this point. The stairway on the right is for authorized personnel only. 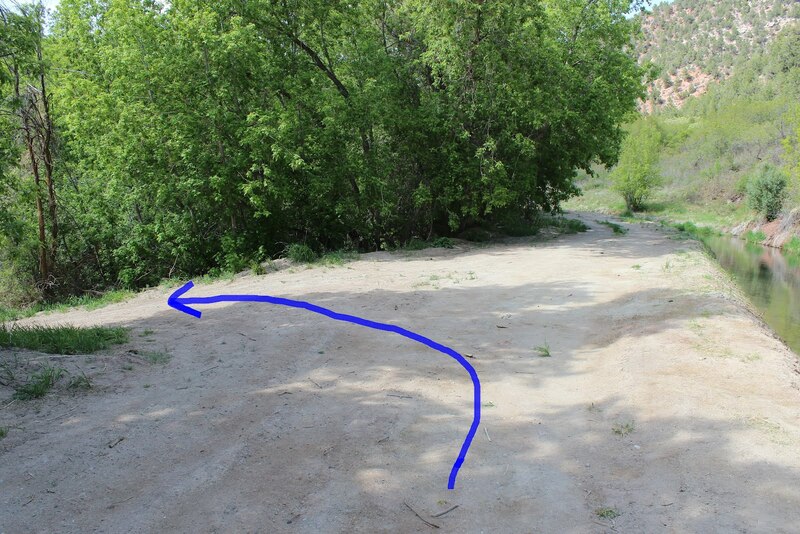 It leads up to an irrigation ditch. The trail begins following an irrigation ditch at the point were it disappears into a tunnel through the mountain. The water going through the tunnel makes a pretty cool noise that is a sound of its own. From here the hike is a leisurely stroll along the ditch. The water must be screened because it was totally devoid of any fish, tadpoles or the like. There isn't a sign where the trail drops back down the hillside to the park but it is the first road that you come to. If you continue along the ditch you will come to a spot where you have to turn around anyway and come back to this road. The road takes you down the hill and comes out near the falls where you can follow the road through the picnic and drive-in camping areas back to where you began the hike. The Squirrel Trail is a nice addition to Rifle Falls State Park that give campers something else to do besides explore the falls and limestone caves. You might try your hand at fishing the creek. There are always stories of the big trout that are released from the hatchery upstream to make their way down the creek to the reservoir. It's hard to say if there is any truth to them or not but if you would like to see it for yourself then all you have to do is 'Take a hike'.